Author’s Note: This is an expanded version of my article that appeared in Asia Times, parts of which have been widely quoted, including al-Arabiya. UPDATE: Yemen has fired another missile at Saudi Arabia. Yemen’s Houthi movement fired a ballistic missile towards the Saudi capital Riyadh targeting a meeting of Saudi leaders at a royal palace on Tuesday, its spokesman said. Mohammed Abdussalam said on Twitter that a Volcano 2-H ballistic missile was fired towards al-Yamama royal palace. The Volcano 2-H is the Iranian Qiam 1 ballistic missile. Saudi Arabia claims it intercepted the missile. Saudi officials claim 83 ballistic missiles have been fired into Saudi Arabia by the Houthis. 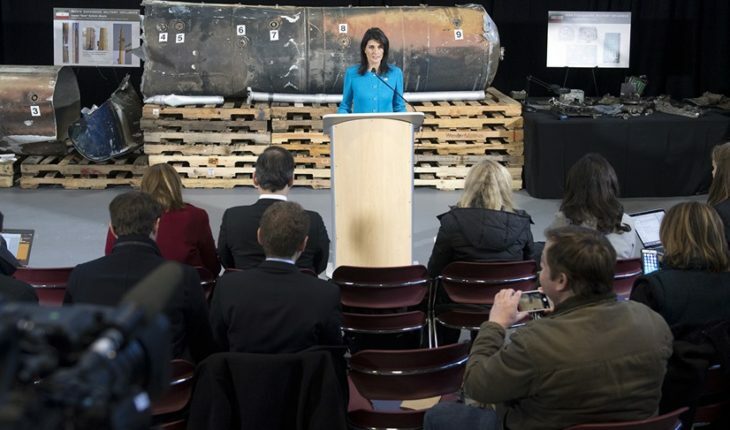 America’s UN Ambassador Nikki Haley called a special press conference on Thursday, December 14th at Joint Base Anacostia-Bolling, the old Bolling Air Force base located not far from downtown Washington DC on the east side of the Anacostia river. There she showed Iranian-origin missiles and other equipment. The most important was the Qiam (Uprising) missile. Two of them had been fired from Houthi-controlled territory in Yemen, one on 4 November aimed at the King Khalid International Airport, which exploded short of the airport; the other last July apparently aimed at the Yanbu oil facility that missed the target. The missile in question was the Qiam 1 which the Houthis call the Burqam (Volcano) 2-H. These missiles are produced in Iran and are based on licensed copies of the North Korean Hwasong-6. North Korea originally copied the Hwasong-6 from Scud missiles obtained from Egypt. The missiles and parts in the display at Joint Base Anacostia-Bolling clearly show the markings of Iranian companies producing the components. The Qiam is somewhat unique. It has a range of 750 km (470 miles) and its accuracy (CEP for circular error probable) is around 500 meters (1600 feet), making it suitable to hit large infrastructure targets such as oil refineries and airports. One recalls that Saddam Hussein fired similar-type missiles at Israel. Such missiles are far less effective against targets where a higher precision missile is needed. The launcher TEL is a North Korean copy of one originally produced by Russia known as the MAZ-543, manufactured in Minsk. One would guess the truck portion is Chinese. It is reported that China supported Iran’s manufacture of the Qiam by providing technical assistance and manufacturing know-how. The Qiam fields a large, separable warhead of 748.4 kg (1,650 pounds) and is designed to carry either high explosives or a chemical-filled warhead. So far as is known this missile is not large enough for a nuclear warhead, a bit of a problem because the UN Resolution only considers nuclear-capable missiles. There are two characteristics that make the Qiam something of a problem for defenders. The first is that with the warhead separating and reentering the atmosphere apart from the missile body, missile defense systems such as Patriot may not be able to differentiate and may go after the missile body instead of the warhead. The second problem comes from the fact that the fins on the original Scud-C have been removed and replaced with stabilizing thrusters that are inside the body of the missile body. The elimination of the fins, a major radar reflector makes it harder to detect the Qiam and means that missile defenses are likely to activate later than optimally. This may be what happened when some four or five Patriots were fired at the incoming Qiam missile aiming for the King Khalid International Airport. The available video shows the Patriot battery firing on low trajectories, suggesting the intercept was very late. Whether this was merely because of a delayed human reaction, or a weakness in the radar is unclear. On display at Joint Base Anacostia-Bolling was a good part of the Qiam missile body, largely in good condition except where it appears to have been hit by a fragment from an interceptor missile, and the reentry portion of the missiles which is on display as a loose pile of twisted metal. As there was an explosion clearly visible on camera shots, it would seem the reentry vehicle exploded on impact and the US and Saudi authorities swept up what remained. Some of the debris landed on crowded streets. Ambassador Haley referred a number of times to UN Resolution 2231, although the official press release also cites UN Resolution 2016 and points out that Iran and the Houthis together were violating these UN resolutions. UN Resolution 2231 concerns the Joint Comprehensive Plan of Action (JCPOA) on Iran’s nuclear program but 2231 also has a provision concerning missiles. It reads in Paragraph 3 of Annex B that the UN “calls upon Iran not to undertake any activity related to ballistic missiles designed to be capable of delivering nuclear weapons, including launches using such ballistic missile technology.” Clearly Iran has been systematically violating this provision and the UN has turned a blind eye on it, preferring the nuclear deal to any complaints about missiles. In his Fourth Report on Resolution 2231 the Secretary General, who was shown the Qiam rocket debris, only called in response for an experts meeting to review the information. The Secretary General also points out that “Major General Qasem Soleimani has continued to travel to Iraq and the Syrian Arab Republic, despite the travel ban provision of resolution 2231” but he offers no recommendation or solution for these significant violations of the deal. For that matter neither does Washington have anything to say. The idea of relying on the UN and the Secretary General, when the actual report language is read objectively, is a dead end for U.S. policy. It is somewhat surprising that Ambassador Haley chose to spin the Secretary General’s Fourth Report as positive given that it hardly supports anything resembling forceful action and omits entirely Iran’s aggressive missile program which is designed to support its future nuclear weapons. Ambassador Haley is perhaps the brightest light in the Trump administration. She was cast in the lion’s den when she was nominated to be America’s UN Ambassador. Not only has she done a credible job, but she has been an exceptional leader at the hostile and corrupt United Nations. It is both surprising and amazing for an accounting major graduate of Clemson University and a practiced politician to so quickly grasp national security issues and articulate them so splendidly. What is troubling is that it appeared that Haley’s press conference, held on a military base was not attended by any senior member of the administration, not from the White House just across the river from Joint Base Anacostia-Bolling, or the State Department or the Pentagon. Indeed, no one introduced her –she walked into the press conference and introduced herself. To an outside observer she seemed to not only have been left on her own, but she had no backup on any policy conjured by the administration to deal with both Iran and the Houthis. One wonders how something like this could happen? I can’t speculate on the situation, but it is certainly the case that without any backup or support Haley could only focus narrowly on the United Nations, which is her area of responsibility. It seems a poor way to treat her. Resolution 2016 is aimed at the Houthis. It has strong language in it including compliance on missiles. The Houthis could care less and the UN is a meaningless organization to deal with the Houthi problem, which in fact is an Iranian problem too since it is Iran that is working to take over Yemen. The U.S. meanwhile is wringing its hands and pushing its allies (namely Saudi Arabia and the UAE) to be more careful in the targeting in Yemen and to open the blockaded Yemeni ports to humanitarian aid. Of course when the ports are open, weapons from Iran will flow in replenishing the Houthis and extending the horrid war in that country. The truth is that putting an emphasis on the UN as leading to a solution either to Iran’s formidable ballistic missile program or to the Houthi-Iranian insurgency in Yemen is a loser. When asked about what other policy steps the U.S. was planned to take, Ambassador Haley did not answer the question (repeated more than one time) other than to say the White House and other agencies were apparently “working” on formulating a policy. The lack of a response to the policy question wasted a major opportunity for the U.S. to take a strong stand and outline concrete steps needed to deal with the Iranian and Houthi problems. Here are a few suggestions for action that can be implemented now. There are others, far more forceful that also need to be considered. The first is a quarantine of Yemen so that the only supplies that it can get in are humanitarian and where incoming ships are inspected. The U.S. should demand that the UN also prohibit air travel to Yemen unless aircraft are inspected and demonstrated not to be carrying war materials and we should go to our allies, Russia and China and insist they join this effort. It won’t be an easy task but that is not an excuse for not trying. For Iran it is high time to shut down the network of suppliers that are feeding Iran’s missile and nuclear programs. The U.S. can design a strong program and put pressure on our allies to enforce it. 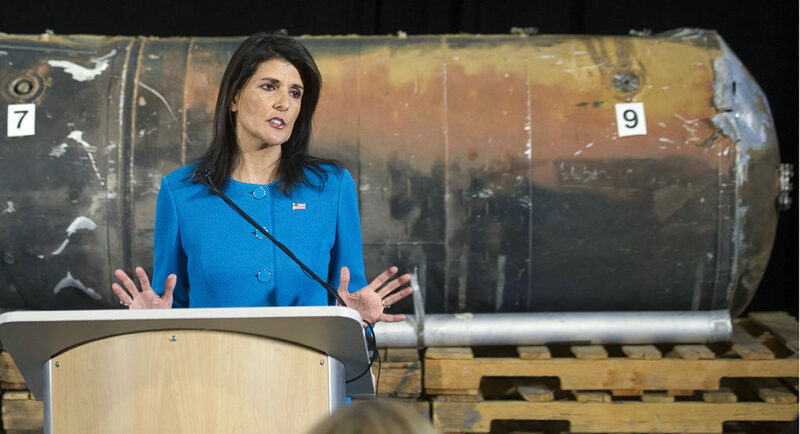 It isn’t a surprise to see that some of the weapons shown by Ambassador Haley contained parts from Western suppliers –such as Yamaha motors for the Shark-33 unmanned explosive boat (its guidance systems was on display and photos of the vessel) that blew a hole in the Saudi’s HMS al Madinah corvette. Washington also should consider taking out critical missile sites in Yemen and related military steps to shut down Houthi use of missiles, robo suicide boats, killer UAVs (like the Qasef-1 on display) and other equipment. We have the skill and the intelligence capability to do this without risking civilian lives. Instead of only shooting up al-Qaeda operatives in Yemen, the U.S. can use its armed drones and Hellfire missiles for this purpose, to good effect.